60,000 points Earn 60,000 Membership Rewards® points after you use your new Card to make $5,000 in purchases in your first 3 months. 5X 5X Membership Rewards® points on flights booked directly with airlines or with American Express Travel. 5X 5X Membership Rewards points on prepaid hotels booked on amextravel.com. 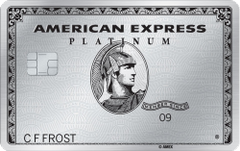 Our take: The American Express Platinum card carries one of the highest annual fees for a card in its class and a rewards rate that pales in comparison to similar cards; however, you can’t beat its extensive list of luxury travel perks, including access to exclusive Centurion lounges.